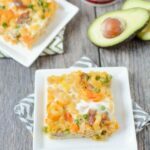 Packed with protein, vegetables and whole grains, this Breakfast Pasta Bake is easy to make. Assemble ahead of time and bake it in the morning to feed guests or bake it on Sunday and reheat it for breakfast all week long. While pasta is cooking, saute veggies, sausage and spices over medium heat for 10 minutes. Add cooked pasta and cheese to veggie mixture and stir to combine. Spoon into greased 9×13 pan. In a small bowl, whisk together eggs and milk. Pour over pasta mixture and bake for 25 minutes. – Feel free to use your favorite veggies and spices. [br]-Top with extra cheese before baking if desired. [br]- I covered mine with foil halfway through to keep noodles from hardening. [br]- There may be a little excess liquid on top when done baking. Simply blot off with a paper towel before serving. [br]- To prepare ahead of time, cook pasta and veggies and assemble in pan. Refrigerate overnight. In the morning, add egg mixture and bake.